These embedded module solutions or COM are being used in an increasing number of drone applications because they allow for a greater degree of flexibility, scalability, as well as longevity, within a very small form factor. Tell us a little bit about Advantech and its products. Founded in 1983, Advantech specializes in the design, manufacturing, integration and fulfillment of a wide range of COTS mission critical hardware for embedded and ruggedized applications. Hardware such as AdvancedTCA, MicroTCA, CompactPCI, VPX, high performance servers, appliances, motherboards, tablets, video solutions, displays as well as a variety of embedded module technologies like COM-Express, Qseven, SMARC and ETX. In addition, Advantech’s Design to Order Services team (DTOS) can develop tailor-made systems or boards to meet specific application requirements by leveraging our broad expertise with world leading technologies. The Automation of everything is a huge topic, Advantech has been a leader in Industrial Automation for decades, but now you are seeing uses in the military and in particular defense drones. How did Advantech become involved in this? We’re currently engaged in a several drone opportunities. The draw has been our latest COM-Express Mini Type 10 module SOM-7569. This module is based on an Apollo Lake Atom processor technology which has a TDP between 6-12 watts and operates in -40 to 85c by design. It also includes ECC Memory support for up to 8GB onboard, offers onboard Flash, includes the latest TPM 2.0 technology as well as H.264/H.265 encode/decode capabilities. In addition, it offers a 15-year product lifecycle, making it ideally suited for use in this type of application. Automation of UAVs and UUVs has become the tip of the spear, so to speak, for the military. But the way in which these drones are being built is changing. Can you discuss the modular-based systems that are making their way into defense drones? Initial drone generations typically utilized either a proprietary processor board or a composite COTS solution, like a PC104 or other embedded SBC coupled with additional customer specific boards. Proprietary solutions, while ideally suited for their applications, were costly to develop and maintain. When using a typical COTS embedded SBC or motherboard solution the manufacturer is forced to deal with a mixed bag of interfaces they may not need and a form factor that may not suite their application. It was only a matter of time before drone manufacturers began to realize the benefits of using a Computer-on-Module (COM) technology like COM-Express. These embedded module solutions or COM are being used in an increasing number of drone applications because they allow for a greater degree of flexibility, scalability, as well as longevity, within a very small form factor. What are the benefits of this modular approach? How does it impact production costs and time? Flexibility – COM-Express modules are available in multiple form factors, interfaces, and performance levels with their own unique feature sets. Leaving drone manufacturers to choose the right combination to meet their situational requirements and allowing them to bring out only the functions that are needed. Processor solutions are available from low power Intel Atom processors with a TDP of 5W to server grade 16 core Intel Xeon-D processors with a TDP of 45W. Basic Type 7 Interface (125 x 95mm) – The new Type 7 interface is a variant of the Type 6, except that it sacrifices IO, such as those used for audio/video support, in order to provide higher bandwidth networking capabilities such as 10GBase-KR. This module was developed specifically for server grade/high performance applications utilizing high end Intel processors such as Xeon-D or i7. Basic Type 6 Interface (125 x 95mm) – Due to the Basic module’s larger footprint it offers the greatest degree of onboard functionality and highest performance of all COM-Express modules, offering a wide variety of Intel Xeon-D, Core i7/i5/i3 and Celeron processor based solutions. Visit our latest Server Grade Basic Type 6 module page - SOM-5991.Visit our latest Performance Basic Type 6 module page - SOM-5898. Compact Type 6 Interface (95 x 95mm) – As the size of the module shrinks, so does the amount of onboard functionality and performance. However, the COM-Express Compact module offers the greatest processor scalability by offering the latest i7/i5/i3 and Celeron processors while also supporting low power Atom processor options both within a single form factor. Visit our latest Performance Compact Type 6 module page - SOM-6898. Visit our latest Low Power Compact Type 6 module page - SOM-6869. Mini Type 10 Interface (84 x 55mm) – Utilizing the latest Atom processors, the Mini’s low power usage, form factor, onboard memory and industrial temperature capabilities make this module ideal for use in embedded low power applications. Visit our latest Mini Type 10 module page - SOM-7569. 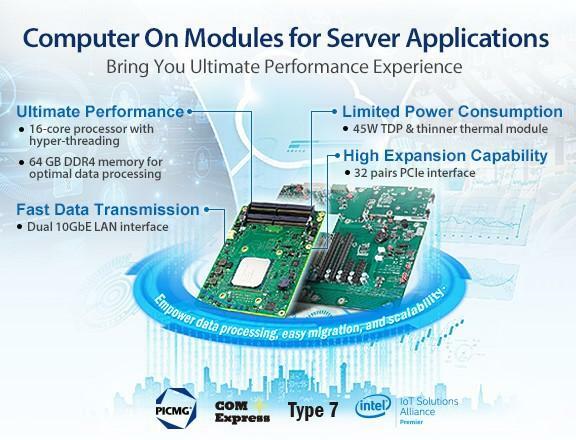 With Advantech COM-Express modules, manufacturers can take advantage of a variety of on-board interfaces such as: SATA, USB, SPI, GPIO, Watchdog, COM Ports, Gigabit Ethernet or 10GBase-KR, as well as TPM 2.0, ECC Memory, Flash and up to 32 lanes of PCI-Express. Scalability – With COM-Express, manufacturers have the opportunity to build their electronics into their own baseboard or “carrier” in order to suite their form, fit and functional requirements, while leveraging the latest processor technologies and onboard features found within Advantech’s line of COM-Express modules. Manufacturers can choose the appropriate COM module to meet their needs while having the flexibility to scale up the performance or bring down the power consumption based on their application specific needs. Longevity – The key active components like processor, chipset and associated components are typically the components on a proprietary design that go EOL causing a re-design. With Advantech’s COM-Express modules, manufacturers can enjoy standard lifecycles of seven -15 years. Enhanced lifecycle plans are also available to extend well beyond that in support of long life programs. TTM & ROI - The key advantage of the COM architecture is obviously its modularity. While there is an initial investment into the companion carrier development vs. a traditional COTS motherboard or SBC, there are significant savings in engineering development resources to be realized over a proprietary design. Time to Market – With COM-Express manufacturers really get the best of both worlds. They can narrow their focus by designing a carrier solution based on their unique technology and experience. Then employ the right Advantech COM-Express module to complement their form, fit and functional requirements. With this approach, COM-Express technology enables manufacturers to simplify their design efforts by utilizing the onboard processor & chipset, as well as wide array of onboard features and technologies the COM-Express module has to offer. This provides a significant reduction in engineering design time and validation, allowing them to capitalize on a much quicker time to market vs. a traditional ground-up design. ROI –With the use of our COM-Express technology, manufactures are able to quickly realize their return on investment in a variety of ways. A couple of key examples being, a shortened development cycle, due to a vastly simplified design, as well as an extended production cycle without the need for a tech-refresh or redesign, due to the long seven - 15-year module lifecycles. In addition, when these COM solutions eventually do go EOL, manufacturers can avoid costly re-designs and minimize re-certifications by selecting from a variety of Advantech’s next gen processor modules to meet their needs. This enables re-use of their existing carrier electronics, minimizes the use of their engineering resources, and further improves their return on investment. Advantech has been leading in industrial automation for decades. How has the engineering team’s expertise in developing next-generation industrial robotics translated to the defense industry? Advantech has a great deal of expertise dealing with shock, vibration and extended temperature environments. We also are experienced with ECC Memory – used for data integrity and onboard security devices like TPM 2.0. We were able to translate this experience and domain knowledge directly for use within defense related applications. Can you elaborate on the benefits of ruggedized robotics in defense? Any rugged system or solution design starts with industrial grade components that must meet stringent requirements in terms of vendor selection, extended temperature operation, ruggedness specifications, and reliability and durability. Advantech uses only industrial grade components which are 100 percent screened to ensure they will withstand industrial temperature environments of - 40 degrees to 85 degrees Celsius. Coupled with an optional conformal coating our modules offer additional protection against moisture, corrosion and extremes of shock and vibration. Which means they are ready for use within the most demanding of defense applications and environments. Explain the ecosystem that seems to be on the top of everyone’s mind. What support services does Advantech offer aside from the modules themselves? Advantech’s focus is the customer and their unique needs. Therefore, we have developed an extensive array of services to complement our modules and bring additional value to our customers. Carrier development and manufacturing, firmware/BIOS modifications, customer specific modifications, conformal coating, hardware/software revision control, thermal/shock/vibration testing, HALT, thermal simulation, heatsink design, as well as integration services. Secure Flash/SSD, Wi-Fi modules, video cards, capture cards, IO cards, communication cards, and other technologies. Look into the future maybe five or 10 years, where do you see Industrial Automation and where does Advantech fit in? That’s an interesting question. You know if you turn the clock back 10 years, you’d see rack mount systems with passive 15 slot backplanes filled with a host of IO cards. Now you can get that same functionality with a laptop and a variety of USB devices. That said, in the next five or 10 years as the processors become more efficient and dies continue to shrink I believe you’ll see this new real estate being used to consolidate more technologies on die as well as down on the board to enable greater capabilities and allow for feature rich small form factor systems. 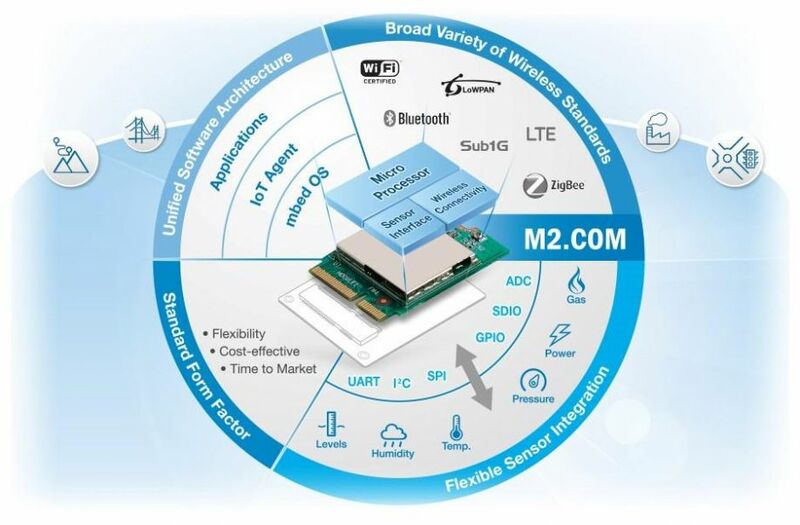 Advantech is leading the way by ushering in the next generation of highly integrated small form factor modules with the new open standard called M2.COM. This new standard is targeted for IoT Sensors/Sensor Nodes with products already available integrating an ARM Cortex-M4 processor with wireless capabilities in an ultra-small M.2 form factor.